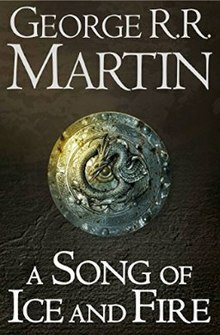 A Song of Ice and Fire takes place in a fictional world in which seasons last for years and end unpredictably. Nearly three centuries before the events of the first novel, the Seven Kingdoms of Westeros were united under the Targaryen dynasty by Aegon I and his wife sisters Visenya and Rhaenys, establishing military supremacy through their control of dragons. Aegon became the first king of the entire continent of Westeros, save for the southerly region of Dorne. 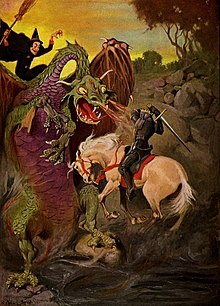 The Targaryen dynasty ruled for three hundred years, although civil war and infighting among the Targaryens resulted in the death of all their dragons. At the beginning of A Game of Thrones, 15 peaceful years have passed since the rebellion led by Lord Robert Baratheon that deposed and killed the last Targaryen king, Aerys II "the Mad King", and proclaimed Robert king of the Seven Kingdoms, with a nine-year-long summer coming to an end. ^ Alison Flood (August 5, 2016). "Game of Thrones: an epic publishing story". The Guardian. Retrieved April 10, 2018. 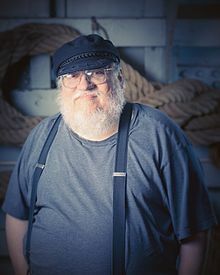 ^ grrm (January 16, 2017). "Another Precinct Heard From". Not A Blog. Retrieved February 18, 2017. ^ "A Game of Thrones Book Details". AR BookFinder. Retrieved November 28, 2016. ^ "A Clash of Kings Book Details". AR BookFinder. Retrieved November 28, 2016. ^ "A Storm of Swords Book Details". AR BookFinder. Retrieved November 28, 2016. ^ "A Feast for Crows Book Details". AR BookFinder. Retrieved November 28, 2016. ^ "A Dance with Dragons". AR BookFinder. Retrieved November 28, 2016.